YA is one of the most popular book genres of all time, and the genre only continues to grow following the success of authors like JK Rowling and John Green. But how did YA start, and where does it go from here? The genre has only been around for a short period, but today we will discover the evolution of beloved young adult novels. Young adult became its own subgenre of fiction around World War II when “teenager” first became a moniker for a particular age range. As the world evolved rapidly, so did entertainment, and thus, “Seventeenth Summer” by Maureen Daly became the first young adult novel. Young adult at the time meant two things: romance or sports, depending on gender. These kinds of books would be the standard until the 1960s. In the ‘60s, one of the most popular young adult novels was published: “The Outsiders” by S.E. Hinton. This was when the term “young adult” was first established, as well. At this point, authors and publishers realized that one-dimensional novels about fluffy subjects had to go. The following decades signaled the rule of violent, difficult subjects. However, teens once again had to deal with cookie-cutter stories, just about dark subject matter this time. At this point, the scope of stories widened drastically. Horror and teen drama were two defining genres, with “Goosebumps” and “Sweet Valley High” entering the scene and continuing to dominate through the highs of the 80s and the lows of the 90s. However, at this time older teens also began to read more mature novels, such as “Congo” by Michael Crichton and “Interview With The Vampire” by Anne Rice. This was perhaps because of the still-lacking storytelling of YA novels, or possibly because of a small selection in the 90s. Starting around the year 2000, YA novels resurged and have not stopped since. Everyone knows “Harry Potter,” “Twilight,” and “The Hunger Games,” which dominated pre-2010. Today, we have authors like John Green writing adventurous coming-of-age/romance novels. Genres are so intertwined that it is common to see a dystopian with several love plots (and I could name plenty). YA has also grown and does not only appeal to teenagers, but also to mature elementary kids, tweens, and even adults. So where will YA go from here? I suspect that keen readers will grow tired of the never-dying romance genre and authors will gravitate toward other genres. Traditional horror has been replaced by books like Ellen Hopkins’ “Crank” series, which unfolds the horrors of drug abuse and other disturbing topics. I would not be surprised if the tides shift and we see more clever suspense, and horror novels take the forefront around the year 2020. 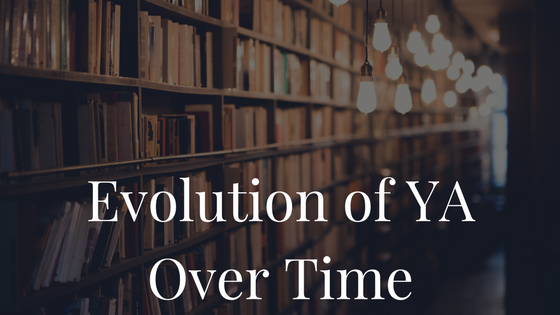 YA is a constantly evolving genre, and each decade seems to grow on the foundation of novels past. With the upswing of young adult, I am curious to see where authors will go from here. One thing is for certain: do not expect to see young adult die down anytime soon.